The bodies, which included a three-fingered corpse, were reportedly found in a tomb near the Nazca Lines in southern Peru, and it was thought by some researchers they could be a newly undiscovered species or even aliens. Both the hand and brain tissue were found to come from a male homo sapien, according to a report from Paleo DNA laboratory at Lakehead University, Ontario, Canada, now available online. It said: "The evidence suggests the source of DNA from the biological material from the cranial brain and the bone extracted from the hand belongs to homo sapiens (humans)." Conspiracy theory website Gaia.com ran a series of videos which claimed the bodies had been found in a tomb near the Nazca Lines in southern Peru, and it was thought they could be a newly undiscovered species or even alien. The bodies were carbon dated to between 245 to 410 AD, but genuine scientists believe they have been created to look like aliens using the "grave-robbed" mummified remains of anciently-buried humans. The organisers of the ninth annual World Congress on Mummy Studies, which took place in Lima, Peru, last August, issued an angry call on Facebook for an official inquiry into whether archaeological crimes have been committed. Commenting on the DNA results, British UFO investigator Nigel Watson said: "It shows it has a male human skull and hands. Another fake bites the dust." However, Gaia.com has since released a further video suggesting it could be a being closely related to humans and still from outer space. Dr Konstantin Korotkov, who is working with Gaia.com on the project, and claims to have previously photographed a soul leaving a human body, suggested in the video they may only be related to human DNA. He said: "From the first DNA analysis, it was proven it’s not chimpanzee, it’s not monkey, but it’s human-like DNA. "Because we know that now we have three types of human like creatures. It is Neanderthals, Cro-Magnon like ourselves, and Denisovan. "Now, at next level, they have to make much more detailed analysis, and much more complicated analysis, so they will create a library of genes, and then they will be able to compare it with database of human subjects. 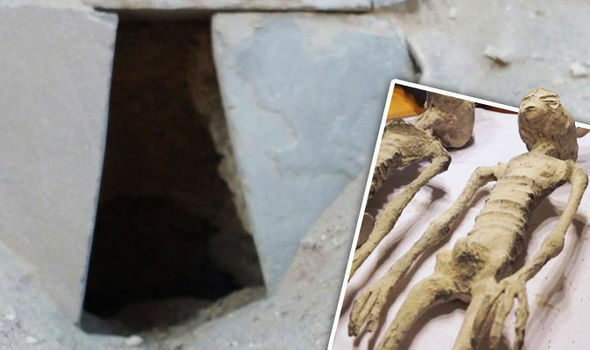 The team said early DNA results of another mummy, named “Maria”, show she is female, and that carbon dating samples from the body matched the hand making manipulation of body parts unlikely. Mexican journalist Jaime Maussan, who is also working with Gaia.com, said they were now testing smaller reptilian looking bodies. He said: “They are very very similar. It is like a reptile skin, a snake skin. "It proves we have two types of beings. "If we can prove they are real we would have six bodies - enough evidence to say this case is real." Dr Raymundo Salas Alfaro, a radiologist from Peru, said in the video: "We are scientifically proving that this body is a real body, that was once alive. "For example, here we have the teeth from the upper arch, and here are the ones from the lower arch. The skull with the remains of brain mass, this part here shows the lungs at the side. "This is the heart, with the bronchus, and the great vessels, lungs at both sides. Writing about the case on conspiracy theory website Collective-evolution.com, Arjun Walia said: "'Human-Like DNA'- what does that even mean? "After all, humans share 50 percent of their DNA with a banana, approximately 80 percent with dogs, and 99 percent with chimpanzees. "In reality, our genomes differ in many ways, but the numbers seem to imply something else. "The point I am trying to make is, with regards to my research into the extraterrestrial phenomenon, the common factor is humanoid." Gaia.com ended the video saying further DNA screening would take place.